You can’t talk about cycle touring in Japan without being asked if you’ve done the Shimanami Kaido route. 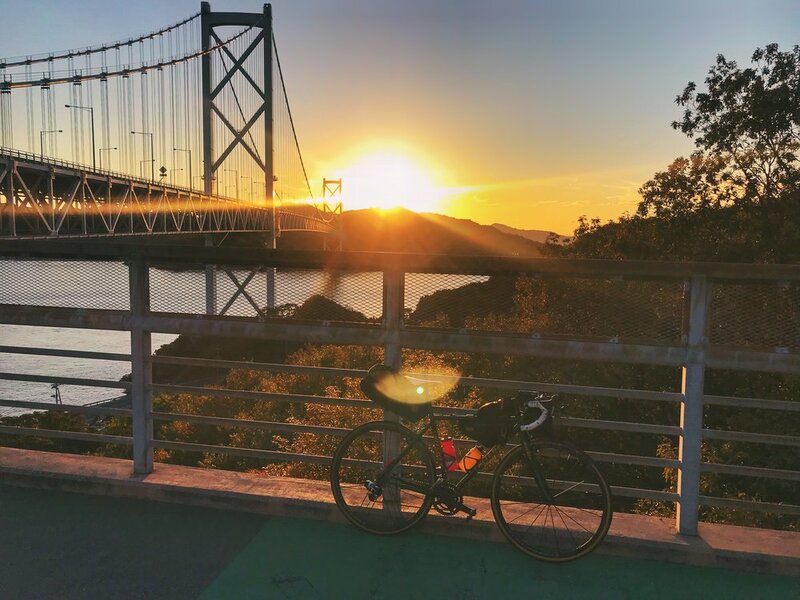 It is admittedly one of the best cycling highways in the world, connecting Honshu Island (mainland Japan) and Shikoku Island, and in between spanning six different islands with breathtaking views of the Seto Inland Sea. It’s a tolled road for cars, but completely free for cyclists. The Shimanami Kaido is a proper bicycle lane that separates cyclists from motorised traffic (although some small parts are shared with motorbikes/scooters/mopeds), making it extremely safe even for newbies, lone cyclists or tourists. There are proper ramps that lead up to the bridge from each island with gentle inclines, and like most roads in Japan - the paved tarmac is smooth with no blemishes whatsoever. The route has proper road markers at regular intervals that tell you where you are heading and how far you still have to go to reach the next town or island or checkpoint. If you cycle with buddies who are stronger than you, these markers are quite useful if you’re often told the regular lie of ‘just another 5 clicks’ or ‘just beyond that tree/corner/random landmark’ (true story). There are also toilets with bidets and toilet paper (even if they are porta-loos) which you can access via stairs with ramps for bikes and lifts that can accommodate bikes, cycle stations for refreshments, seaside cafes, camping grounds and of course, Japan’s infamous vending machines. To sum it all up, Shimanami Kaido is a cyclist’s pipe dream - that really exists. The only thing that’s wrong with it, is that there’s not enough of it. Essentially the highway is a network of bridges that take you up and down one island to the next, and only stretches 70km. Even for a newbie cyclist or a tourist out for a joyride on a rented bike (yes they are available there, even e-bikes), you can finish the entire length of the Shimanami Kaido in a single day. To be fair, this is what most cyclists will do. But the Folding Tales crew likes a bit of a sufferfest when they travel, so Eka, Maya and myself wanted to go one step further. The gran fondos on Shikoku were obviously not enough to satisfy our inner masochists (every cyclist has one, the difference is how persuasive this hidden demon can be). So we decided to stretch it out a bit further to get a bit more mileage. And we were infinitely glad that we did, even though there were many parts of the six islands that we didn’t get to explore. Just a quick note: You can spend a whole week on the Shimanami Kaido alone, exploring each island in a leisurely fashion. If you look at the full route of the highway, it doesn’t circle through all of the islands in entirety, but skirts through some parts only. Some islands are bigger than others obviously, but you can stretch out your ride significantly if you wander around each one extensively in a single day. 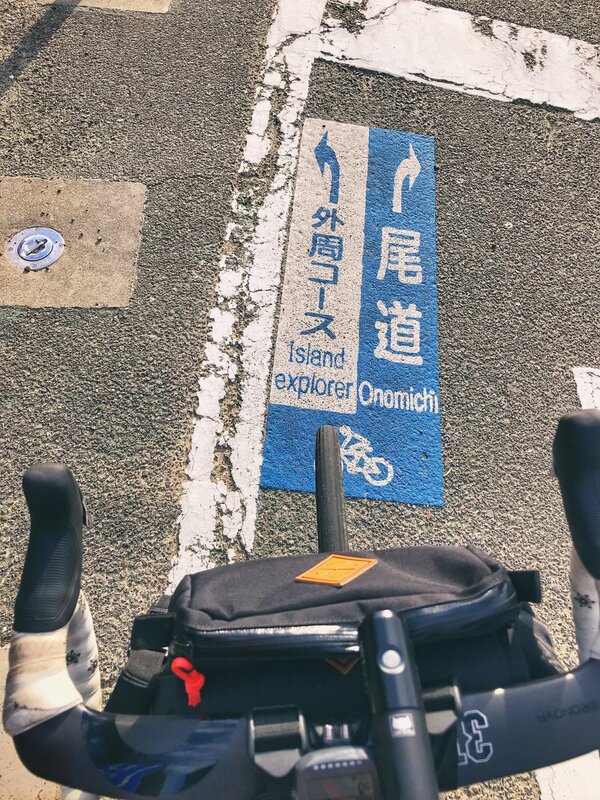 Our chosen route was done in reverse of what cyclists normally do, starting in Imabari, Ehime Prefecture and ending in Onomichi, Hiroshima Prefecture, instead of the other way around. This is because Shikoku was both cheaper and easier to get to from Osaka Airport, considering we could take a bus straight to Tokushima, where we started our cycling tour. We opted to stretch the ride out to two days, spending one night at a lovely ryokan called Chaume at Omishima. 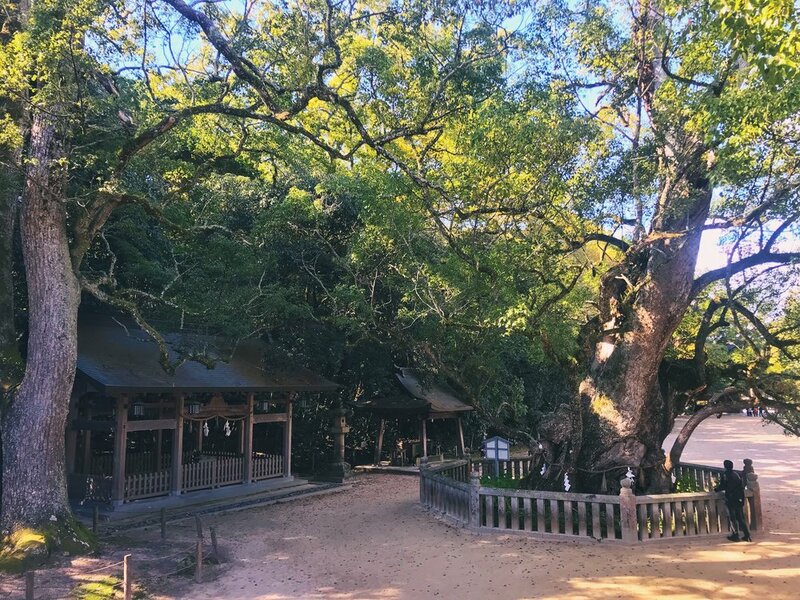 We wanted to make a visit to the Oyamazumi Shrine, which has a museum housing the greatest collection of historical samurai weaponry and armour in the whole of Japan. Each day would be a 50km+ ride without too much of climbing, rides easily completed around sundown. After breakfast, we started with a quick visit to Imabari Castle, one of the "three great water castles" with an impressive and beautiful moat that is fed by the sea. The moat was designed to be extra wide, due to the widespread use of firearms in that era. It was built in 1602 by Todo Takatora for himself, who is considered to be the greatest Japanese castle builder. Entrance is free but the museum in the keep charges 500 yen, which I suppose is worth paying to see the collection of samurai armour inside. We didn’t have that much time to spend wandering around, most likely because we were distracted by an adorable mackerel tabby cat that roams freely around the grounds. Fat, fluffy and friendly, it was clear that she is fed quite well by someone within the castle grounds. After passing over Umashima Island at around the 22km mark we had crossed over to Oshima, arriving a little late for lunch. 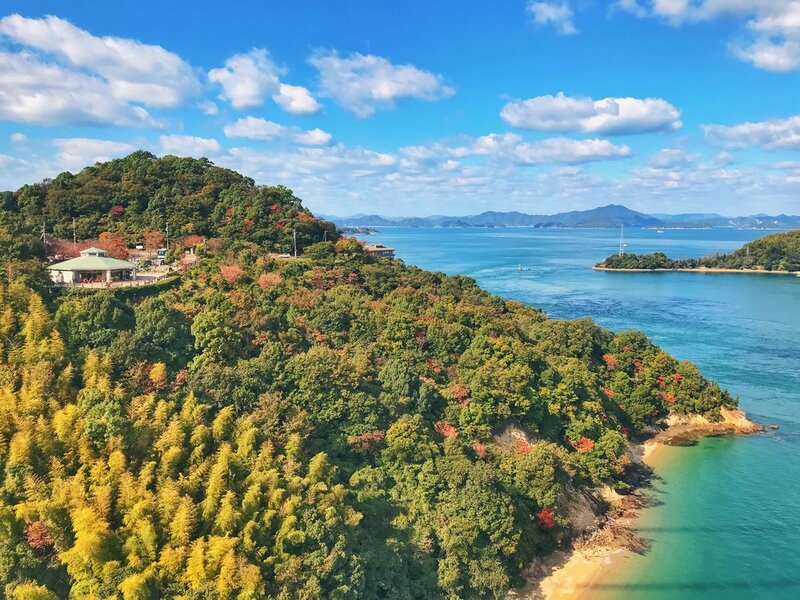 On a side note, Umashima is the first little island on the Shimanami Kaido, once used for breeding war horses, but is now a quiet place with little beaches and abundant bird life. You can take the lift from the cycling highway down to the island, but take note that there are no shops or restaurants there. On Oshima Island, we had a little bit of exploring to do before we found a spot to eat, with Eka’s crankiness spiking every extra meter we had to cycle in our search for food. Restaurants or cafes often appear closed from the outside, with no proper signage to tell you what they are. Generally, we had to depend on Google to locate these eateries. We eventually found a tiny place that was almost ending lunch hours, which turned out to be one of those wonderfully serendipitous things that worked out extremely well in the end. It was manned by a single young man with sculpted eyebrows, a pasty white complexion, pencil straight black hair and a bandana, who only spoke enough English to help us figure out how to order. The small cafe didn’t seem very fancy, but served the BEST Okonomiyaki that either one of us had tasted. It was made layered up the Hiroshima style with noodles inside, and we were encouraged to load up on mayonnaise and the special sauce that came with it. Good grief, it was insanely good. Hunger appeased, we pressed on to Hakata Island and rode through without making any major stops. At the 40km mark we’d reached the shores of our destination for the night, Omishima, as the sun began to set and a chill wind gathered strength. With light fading fast we managed to reach Ryokan Chaume before it was total darkness, managing to bump into the charming matron of the family who runs the place, right outside. She helped us park our bikes in a locked shed outside and checked us in, where an amazing seafood dinner was waiting once we had a warm bath each. 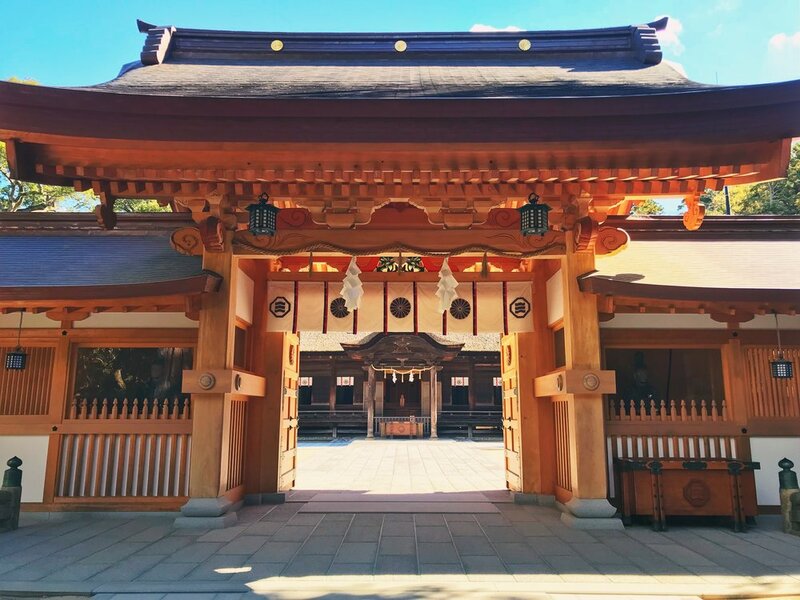 The day began with a visit to the Oyamazumi Shrine, once one of the most important shrines for samurai over the centuries. They were known to stop there and pray for success in battle, returning to make offerings of their weapons and armour if successful. 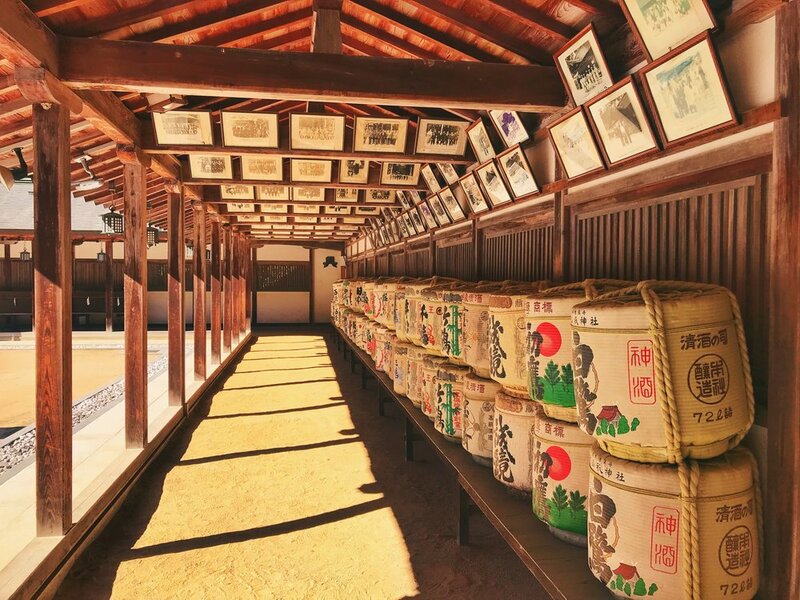 These offerings make up the shrine's historic collection that you see there today, many of which are in excellent condition, with the indigo dye still visible in many garments. Among the collection is a number of female samurai armour, which is not something you will find easily around the rest of Japan. 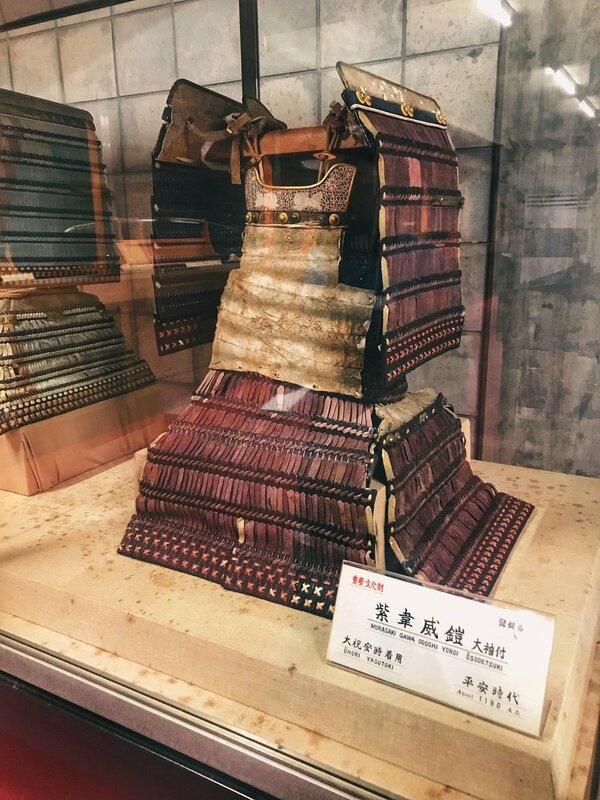 There’s an especially tiny set of armour with a particularly small waist, which belonged to 16 year old Tsuruhime, who took charge of the shrine after her father the chief priest died, successfully leading an attack against the invading Ouchi Clan. She’s a bit of a local hero, and a statue of her stands with an arm stretched out as if in welcome, outside the shrine entrance. We also wandered around the Omishima Marine Museum, which housed a wooden boat called the Hayama Maru used by Emperor Hirohito for biological research, as well as the resulting specimens and old photographs. The Omishima Art Museum is located across the road from the entrance to the shrine, but we gave this a miss since we had to start our ride for the day. The museum houses the gems of the island’s art scene, with a wide range of contemporary Nihonga, Japanese style paintings. So off we went again, with our pace matching the previous day’s to savour what was left of our tour. This was the last day on the Shimanami Kaido after all, which meant an end to our journey before hitting the city of Osaka. There’s always mixed feelings at this point; relief at having made it this far, sadness that the tour is coming to an end. At the 18km mark we’d crossed over to Setoda Sunset Beach on Ikuchi Island. Ravenous again, we opted to stop at a beachside cafe to have a lunch which included some of the local delicacies, including octopus pasta. By teatime we’d chalked up 33km in total, and crossed over to Inoshima Island, looking for a bite to eat yet again. The second half of the tour was not a difficult one, least of all the Shimanami Kaido segment, but we reasoned that our internal engines were still burning at a higher rate, which explained the more frequent hunger pangs. We had ice cream at Will Cafe Beer Bar, since they’d just opened their doors and there was no hot food being served just yet. Keeping in mind that the sun would set soon, we hastened on our way immediately after another visit to the toilet at the cafe. With darkness approaching a chilly breeze also made its presence felt, and we only made one more stop for sunset pictures on the final island called Mukoujima Island, before continuing the ride. As the sun finally set, the three of us had a WTF moment looking for the right way to cross to Onomichi from Mukoujima. We realised belatedly that we’d lost sight of the blue road markers that tell cyclists they are on the Shimanami Kaido, and the traffic had picked up significantly as motorists went home for the day. A brief but aimless search in the waning light was brought to an end with the help of an elderly passerby, who pointed us to a small dock to take a 100 yen ferry to the other side. Cycle tourers are a regular sight there after all, and he correctly guessed that we were feeling a bit unsure of where to go next. You can reach Onomichi via the final Shimanami bridge crossing, but the unexpected ferry ride turned out to be our best option, since our guesthouse was nearby, with our luggage waiting in storage. If we had taken the bridge itself to complete the tour properly, it would have added a few more kilometres to the ride at a time when the roads were already congested, Eka and Maya were already unable to see properly in the dark, our lights were running out of juice and we were all tired and hungry yet again. This is where I will leave you with a bit of a cautionary note. The Yadoka-ri guesthouse that we booked (looks better in photos. No really.) allowed us to share a room for three, but is better suited for the extremely budget conscious travellers, i.e. backpackers or cycle tourers looking to save a lot of money. In hindsight, we should have splurged for two rooms at the nearby Onomichi U2 bike hotel, which came with a bathtub in each room overlooking the sea, and would have been a superb end to the tour. It would have been highly preferable to our sad, sad, night in shanty town. At Yadoka-ri there was a single shower and a single toilet for up to 16 guests to share (we counted the beds in the dorm and rooms that we could account for - there may have been more). Eka was forced to take a cold shower after the hot water ran out, while Maya and myself had to wait half an hour on the creaky wooden stairs while another cycle tourer hogged the shower to wash his clothes. I got my accidental revenge on him by going to the toilet in the middle of the night, landing heavily on the most creaky part of the floor at the base off the stairs, right in front of the dorm. I could have sworn I woke everyone up at that point. Did I mention we had to pay extra to use their towels? Which brings me to my next point. The guesthouse was run by a group of youngsters who had boarded up and divided the place into a number of rooms all by themselves, in a DIY manner that wasn’t exactly tasteful or efficient. There were cold drafts coming in from the windows, and almost no noise insulation at all. We fell asleep purely by habit, but it was not a very restful night. In hindsight it wasn’t that cheap either, although Eka will irritably snap “I don’t remember!” when asked for any details of the place. Stay there at your own risk; consider yourself warned. Dinner was a small ramen joint that had only enough space for less than ten customers, but had a vegetarian option and was run by a nice chap who spoke good english. This area of Onomichi is a quiet one, and dinners are best had early rather than late, since we ran out of options by the time we were out hunting for food. We all woke early the next day, eager to leave such a disappointing “guesthouse” behind. There was an open air patio that had barely enough space for us to pack our bikes, and once done we wheeled the cases to the nearby Yamato office to send our bikes off to our final hotel in Osaka. After a lovely breakfast overlooking the sea and a stroll through the docks our moods had improved tremendously. We boarded our train at the nearby Onomichi train station, switching to a Shinkansen at the halfway point to reach Osaka by late afternoon. It was definitely a change of scenery from our more than one week of cycling through the mountains and along the coast. Stay tuned for our Osaka exploration, where we left the Ritchey Breakaways in their cases, and rented some quirky but fun foldies to get around instead!